Rinse fresh blue mussels in tap water and set aside. Discard any mussels that do not close after being rinsed. Heat olive oil in a large pan over medium-high heat. Add chorizo and saute until it starts to brown. Add garlic, paprika, tomato paste, sugar, chili flakes and cumin. Stir well and cook 2 minutes more. Add white wine, salt and pepper and lemon juice. 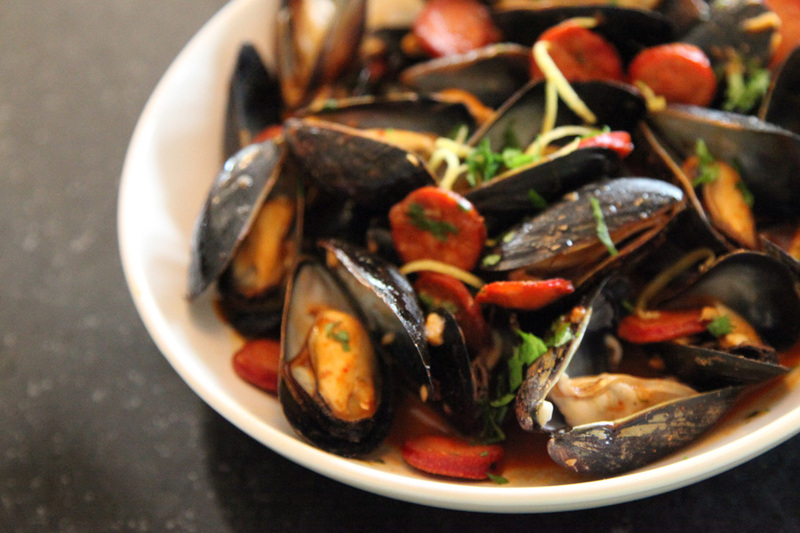 Bring to a simmer, then add mussels. Cover and leave to steam for 5-7 minutes, until mussels open. Discard any mussels that do not open. Transfer mussels to a serving dish and top with chopped cilantro and lemon zest. Serve with slices of crusty bread.